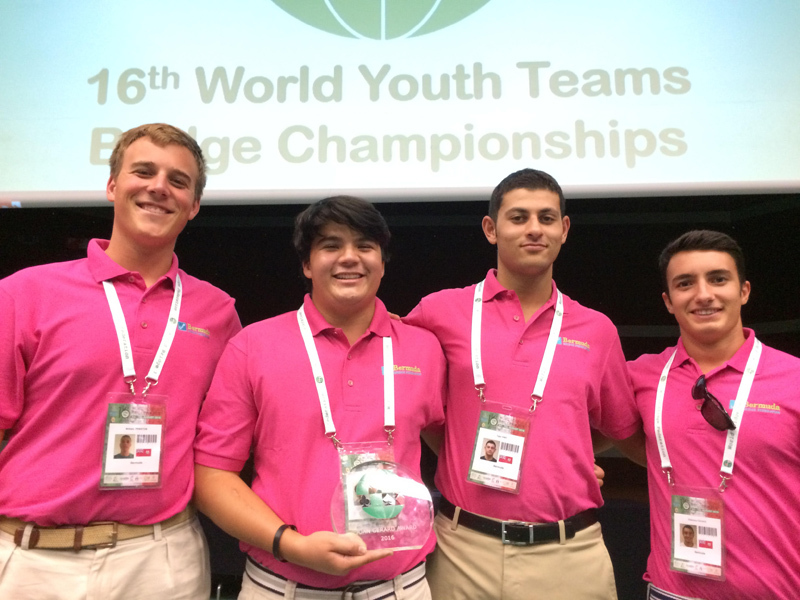 Michael Viotti, a physics teacher at Saltus, led a team of four students to the World Bridge Federation’s Youth Team Championships in Salsomaggiore Terme, Italy from August 3 to 13. The team included recent Saltus graduates: Tyler Irby, Gianluca Cacace, Liam Peniston and Ruskin Cave. John Burville, a seasoned international player from Bermuda, also attended as the team’s non-playing captain. “This is our first time doing anything like this – not to mention the first time Bermuda has ever sent a youth team to a bridge world championship,” Mr Viotti said. “They performed admirably given that they were facing the best players in the world in their age group. “While they didn’t advance to the knockout stages, their play had been steadily improving throughout the week and overall they produced solid results in the consolation event.” The highlight of the event occurred when the Bermuda team was awarded the Joan Gerard award for their division. The award looks to “reward aptitude, fair play, good sportsmanship and a friendly international spirit, rejecting any discrimination”. Each team, tournament official and volunteer was allowed to cast a vote, however no team could vote for a representative from their own country. The trip was made possible thanks to support from the Saltus Foundation, Bermuda Bridge Club, Bermuda Bridge Federation, the Caribbean and Central American Bridge Federation, as well as private donors. A “significant amount” was also raised by the student’s families and from a car wash the team members organised themselves. Dressed in traditional Bermuda shorts, the team received a warm welcome during the opening ceremony for the competition. Student Tyler Irby said he was happy to put the island on the map for its manners and its sportsmanship. “[Bermuda is] known for being a very friendly nation and that’s something we want to share going forward,” he told the World Bridge Federation.